More than half of people who died because of fire in last year died in their apartments and houses. Most of those fires started between 2 and 5 am, when inhabitants were sleeping. New public notice requires to have the fire alarm in every new apartment and new house. It’s in effect from July 2008. “Public notice about technical conditions of fire security - č.23/2008Sb. 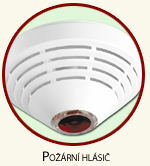 Certificated fire alarm JA-80S combines smoke and temperature detector. It’s independent acoustic alarm and also it can be used as part of the system OASIS. The fire department recommends the fire alarm into every building. 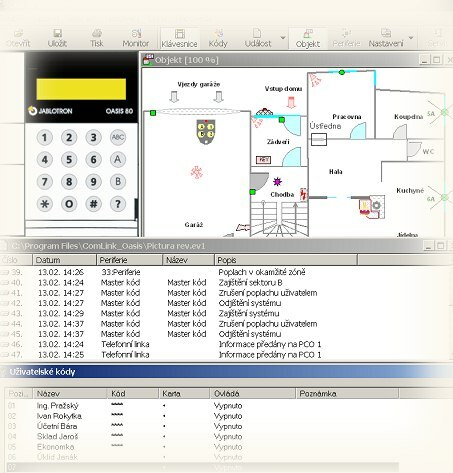 Our clients with OASIS security system easily reach integration of fire alarm into the whole security system. It protects the life during a sleep and a property in absent altogether. Detectors of the intrusion doesn’t require cables connection – it’s wireless and very reliable. Range of wireless detectors can be hundreds of meters. Complete line of detectors and sensors of intrusion includes all necessary components. These alarm devices are reliable and it can secure four floor houses with a separate garage and with the garden houses. This system allows separate secure all of these objects. It also makes possible to easily add or remove devices into the system. The alarm is transmitted by GSM network to the user or to the security agency PCO. Monthly cost is about 150 CZK even if the house is in very often control connection. 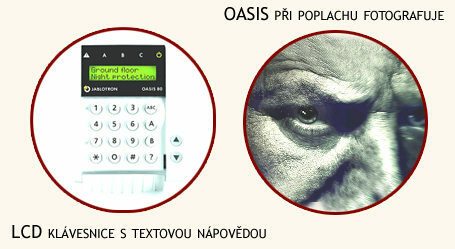 The control of the OASIS system is much easier than other security systems. Users fancy key-fob, which allows control of all parts of the system. The control of the alarm system is possible via internet, RFID chip, self-phone. You can take control of electrical devices by SMSes (heating, control of lights, opening of garage doors). A remote control is highly appreciated by owners of weekend house. They can set up the temperature even before their arrival. The alarm system is carefully manufactured and tested. Its quality is provided to a customer without any changes. Every single system configuration is separately manufactured with every part which is required by the customer. The system is tested after every new installation before it’s handed to our client. We dedicate necessary time to recognize individual needs of every client. We suggest the individual solution of the alarm system for every client. We present a solution in a graphic or text form. We pre-set and create the security alarm in advance right after an approval from a customer. A careful preparation is essential for carefree functioning. A process of the installation is quick and easy. An installation does not influence living in a house or company. Goods in shops, cables, water installations are not in danger. A wireless detector is possible to locate without almost any limitations. It can be installed into a garage houses, garden houses or gates without necessity of connection through cable. The wireless windows contact is a revolution in secure of the windows. The cable alarm security is old and was replaced. Its biggest problem was in difficult installation. Alarm security is on when inhabitants are inside an apartment. Simply it’s on in the evening and during the sleep. Methods of contact security of windows and doors is also very effective in a case when a client has a pet. Dogs, cats, parrots, etc. Motion detectors “PIR” in the presence of pets easily starts an alarm. It must have some restrictions which lowering effectivity of the system. A security of a building during a construction process. The alarm system OASIS is designed to be useful already during a construction process. Detectors might be easily relocate. Wireless detectors need to have batteries. A average lifetime of a battery is three years. The longest lifetime is in a house with irregular using (from 4 to 5 years). The shortest lifetime is predicted in often visited buildings such as restaurants, gyms, etc (from 2 to 3 years). OASIS automatically controls batteries and it sends a signal when it’s necessary to change batteries. A wireless security alarm system is completely mobile. Only the central of the system must be plugged in 230V. Installation, relocation during the moving or during a change of setting or during a addition of another part of the OASIS system is as easy as first installation. A handy user is capable to do a lot of these changes by him-self. The graphical design is the most suitable document for: maintainance, using, widening of the system. It is part of the whole project, it can be provided to monitoring center and PCO. It shows a range of an object with entrances and it also shows borders of the security zone. A graphical design is a important tool for servicing the system. Manufacturer provides a single computer programme for both user and service man. The user can administrate passwords for other users, set-up SMS reports, browse or archive what happened. All of this just by simple connection to a computer. A Garage is constantly secure, it’s deactivated only during parking or departure. AB Window’s and doors detectors are added during the night with possibility of ventilation. ABC Whole detection of a house is active when nobody is at home. An optical and an acoustic detector replace EYE-02 (camera of the system with images transferring by MMS) in a living room.